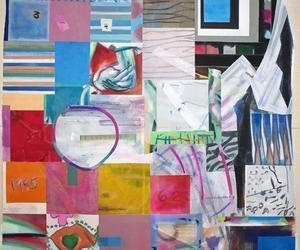 A renaissance of abstraction has recently surfaced cross New York. The sine qua non of modern art, abstraction fell out of favor in the late twentieth century with the emergence of postmodernism and its concepts of paradox, pastiche and deconstruction. But at the beginning of the twenty-first century, abstraction has arisen from the ashes of its professed death with a power and potency rivaling its inception. This phenomenon and the reasons for its resurgence are considered in NEW NEW YORK: Abstract Painting in the 21st Century. The exhibition takes its title from the New York School, a movement by artists that established abstract expressionism in New York City in the 1940s. It surveys a cross-section of nearly thirty established, mid-career, and emerging artists currently living and producing abstract paintings in this same historical city. While attentive to each artist’s distinctive, unique and individualized contributions, the exhibition examines the meanings they make collectively as well. Reflecting a range of current approaches to abstraction, the artists carry over lessons from twentieth century pluralism that they utilize to reinterpret, reanimate, quote, remix, mash-up, and morph a variety of genres, historical movements, and traditions of mark making. Furthermore the plethora of historical references is often coupled with a feverish inquiry into the new, particularly the investigation into the emergent vocabulary of post-internet art, a genre that reproduces and alters the organizing principles and systems of online visual culture. Many artists featured in the exhibit such as Julie Mehretu and Terry Winters are world renowned for their innovative painting practice. NEW NEW YORK demonstrates a thirty-two thousand year-old medium’s participation in the urgent dialogue of survival in a world deluged with information and rapidly changing technologies.